Online invoicing has never been easier. Send unlimited invoices for free. Get paid fast with customizable, professional invoices that make it easy for your clients to pay. PayPal makes it easy to manage your billing and get paid from virtually anywhere. Customers can make a payment securely in just a few clicks and you can receive your money in minutes. Create and send an invoice in minutes, from nearly any device. Choose to send your invoice via email or using a shared link. There’s no need to download invoicing software. 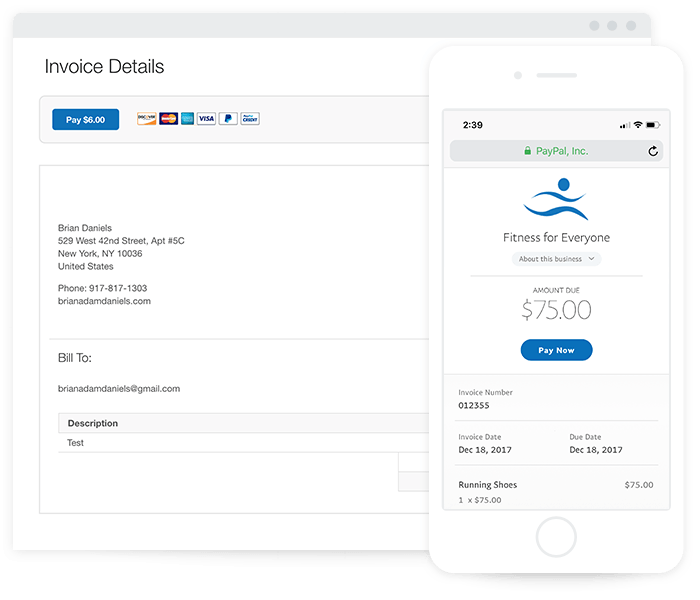 Add your logo, contact information, and custom fields to your invoice template - you can save it for fast access whenever you do your billing. Manage everything in one place. View your billing history online, track payments, and send reminders. 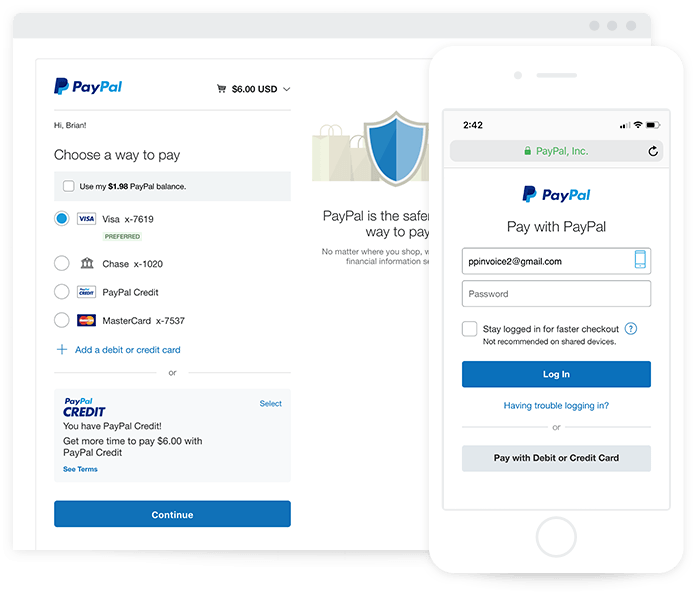 You can accept debit or credit cards, PayPal, and PayPal Credit - your customers don't need a PayPal account to pay you. And with PayPal Credit, your customers can get financing for 6 months on purchases of $99 or more* while you get paid in full, up front. For clients who prefer a paper bill, you can save your invoice template as a PDF and print. *Applicable for qualifying purchases of $99 or more if paid in full within 6 months. Customers check out with PayPal and use PayPal Credit. PayPal Credit is subject to consumer credit approval. 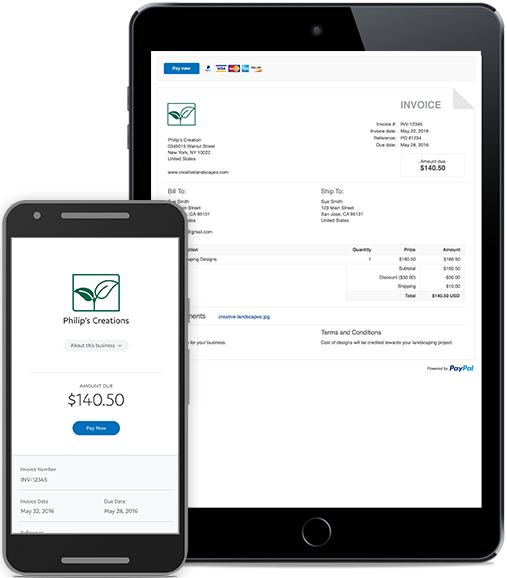 PayPal Invoicing comes pre-loaded with features for small businesses. Sign up for a PayPal account, or log in if you already have one. PayPal shares a link to the invoice with your client via email, or you can share a link on your own. Customers can make a payment with their credit or debit card, their PayPal account, or PayPal Credit. ** We’ll notify you when the money lands in your PayPal account. How to start billing with PayPal. 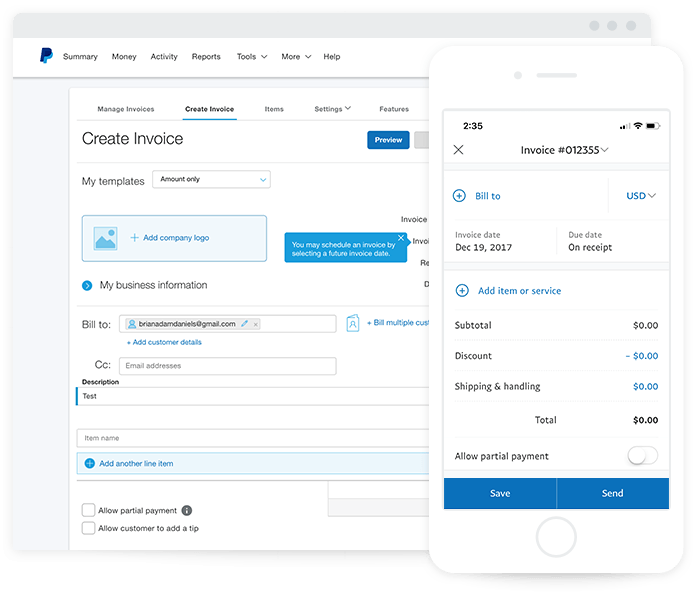 With the PayPal Business app, you can create and send invoices, track unpaid balances, send reminders, and stay on top of payments all on your mobile phone. Start billing quickly and easily with PayPal.